While group camping is one of the most awesome outdoor activities out there, its outcome will depend on your preparation. An ideal 6 person camping tent remains the most important prerequisite when you consider venturing out in a family or group of friends of six or so. Without one, you will be left vulnerable to the harsh outdoor elements including bad weather and insects making your camping uncomfortable and less memorable. Worse still, this could potentially threaten your health several days or weeks after your expedition making you hate any future camping trips. We give you a chance to get the best experience during your camping or backpacking by giving you the most impartial 6 person tents review. But wait! Who needs a 6 person tent? Well, with an interior space of between 150-180 square feet, six person tents are ideal for fairly large families. Again, friends of about 6 people who want to spend fun nights together during camping will find these tents incredible. Five people will find these tents amazingly large while fairly larger 6 person tents will provide ample sleeping space for up to 8 people, though with limited space to move around. Before we came up with the below list, our team of experts considered several aspects including tent durability, buyers' reviews, design, type, size, sturdiness, weight among other essential factors. Now, let us get to our countdown! 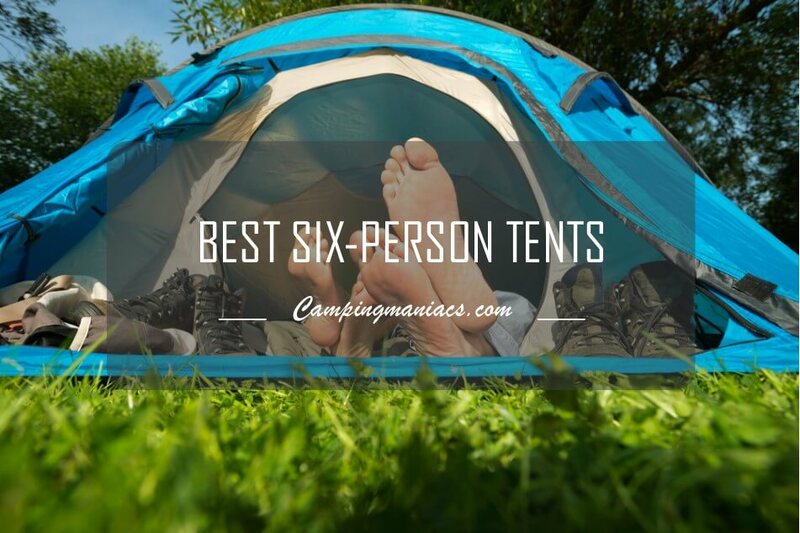 Which are the best 6 person tents of 2019? Without much ado, let's take a dive into it and see which six-person tent best suits your needs. This is not a list of the best Coleman tent reviews as you might be thinking by now. Coleman tents make the bulk of this review list simply because when it comes to outdoor equipment you will agree with us that Coleman is a respected brand. Now, the Coleman Hampton 6 Person Family Camping Cabin Tent is your ideal tent if you need the best during camping. It is comfortable, spacious, private, well designed and ultimately luxurious. The tent remains one of the most executive tents out there and a special tent for families who want to have the most homely outings. If you have no problem with going beyond the ordinary in terms of prices then it is worth investing in this tent. Let us find out why we think it is the best luxurious tent out there. One important aspect of cabin shaped tents is that they are like a typical house and offer you almost equal height all around the tent. Like the name suggests, camping in the Coleman Hampton 6 Person Family Camping Cabin Tent gives you feeling of the Hampton Inn. This tent features a hinged door, a room divider and sufficient space to fit two queen sized air beds. The room divider makes privacy something you will really like about this tent while the hinged door eases in and out movement. Just like modern Coleman tents, the Coleman Hampton 6 Person Family Camping Cabin Tent features the patented WeatherTec system with welded floors and inverted seams to prevent leakage and invasion of bugs. The Hampton tent has sufficient ventilation. These features make this tent suitable for use both in the warm and rainy seasons. Again, the tent stands firm and will withstand considerable winds hence it is tent that will go beyond the ordinary. Spacious enough to accommodate camping gear. Great cabin design and color will stand out among other tents. Has sufficient peak height . Has the ability to withstand winds. Slightly heavier but you will still find it compact enough when you are using a car. Costs higher than most tents. If you are not working under a fixed budget then the Coleman Hampton 6 Person Family Camping Cabin Tent is a tent that you will not regret investing in. It works perfectly in the 3 most common camping seasons so you do not need to keep several tents. Apart from usability, the manufacturers of this tent must have put amazing effort in the design and choice of color. Despite the few downsides on weight, price and pitching, this tent would have made it to the best pick! The Eureka Copper Canyon 6 Tent is another exciting pick that makes it to this list. It conveniently brings in essential features that you will need in the best camping tent. The cabin design tent is spacious and comfortable, adaptable, easy to pitch and fairly priced. It does not get better than this particularly in an era where there are so many average camping tents. 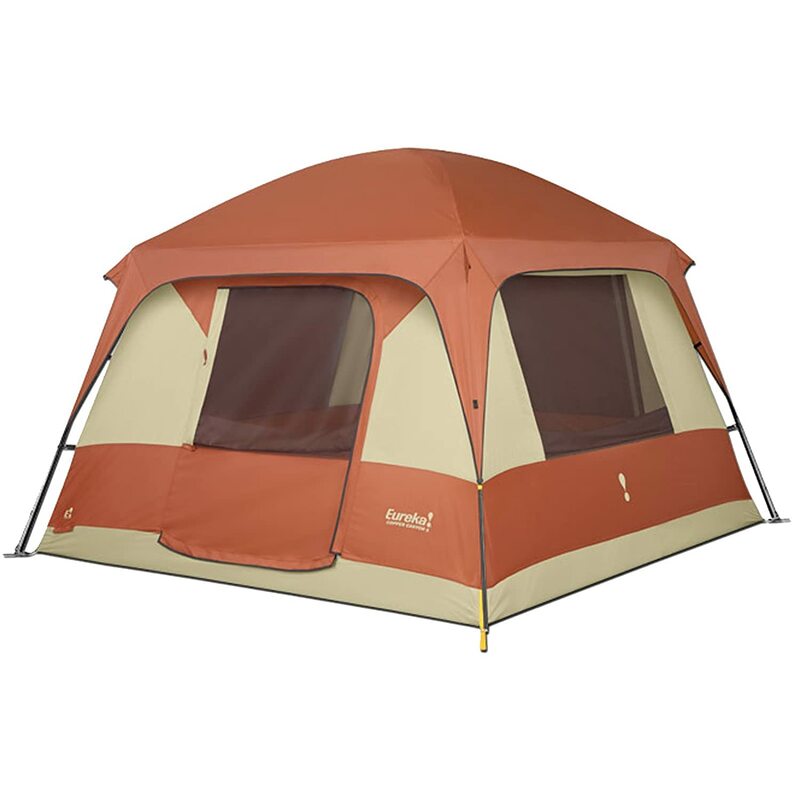 Just like all freestanding cabin tents, the Eureka Copper Canyon Tent suits people who want quick pitching. More importantly, if you need more than average ventilation then this Eureka tent should be your best pick. The Eureka Copper Canyon 6 Tent is designed to provide the most sufficient air circulation. This is aided by the mesh roof, the large door and windows. The windows look neat because they stash neatly in the pockets hence no need for ropes and loops. These features not only provide unprecedented ventilation and outside visibility but also reduces the rates of condensation in the tent hence more healthy. More campers means more camping gear to meet their needs. Without a space to store them, your camping will look jumbled, disorganized and unappealing. The Eureka Copper Canyon 6 Tent provides you with additional storage pockets where you can keep your essential gear. Keep your toothbrushes and sanitary in a way that will make you want to go camping again! Freestanding and easy to pitch. Spacious and has a decent peak height. Has a large door for easy entry and exit. Not available in variety of colors. The rainfly may drop water by the door particularly when facing the wind when it is raining. With so many average tents out in the market, the Eureka Copper Canyon 6 Tent will stand out among the best tents. Apart from the non-widespread concern about the rainfly, this tent is credited with remarkable ventilation which has the ability to prevent condensation by maximizing airflow. Most users recommend this tent just like we do. It is almost impossible to talk about tents without mentioning Kelty. In fact, Kelty is an outstanding brand when it comes to quality and reliability of any outdoor equipment. The Kelty Trail Ridge 6 Tent is one such product from Kelty that will make you like camping and Kelty as a brand. Read further and get to know the essential features of this tent. Well, the Kelty Trail Ridge 6 Tent is most suitable for those who really want to have it light and fast. More importantly, it still brings in essential components like ventilation, durability and adaptability. Not so many 6 person tents will get to under 15 pounds. The Kelty Trail Ridge 6 Person Tent is therefore undoubtedly one of the most lightweight 6 person tents you will come across with a minimum trail weight of merely 12 pounds and 3 ounces. This, however; does not compromise any of its qualities. It still features a durable rain fly, strong aluminum poles, a hug clip and gear loft loops. Moreover, the tent packs into just a small item for easy portability. Camping can be messy if you do not have enough space to store your gear. The Kelty Trail Ridge 6 Tent saves you from this nightmare by incorporating two vestibules at the corresponding doors to help you when you need to keep your camping gear organized. That is not all as the tent also comes with adequate storage pockets for smaller items. Due to unending in and out movements, tent floors are often prone to wear and tear unless there is a footprint. Kelty provides a footprint that will protect your tent floor at no additional costs. Adequate storage space in the pockets and vestibules. Two doors making it efficient for in and out movements. Comes with a footprint at no additional costs. Costs slightly higher than the ordinary tents but it is worth the price. As the name suggests, Kelty Trail Ridge 6 Tent is a tent you will tag along even in the smallest and most difficult terrains. This is because it is lightweight and packable. While a few people say that it has a comparatively smaller interior space, it is important to note that this concern is compensated for by the vestibules as your camping gear will not take any of your sleeping space. As a matter of fact, Coleman never disappoints! While their Sundome 6 person tent did not take the top spot here, it is sundome shape, trademark WeatherTec System, incredible peak height and ventilation just to mention a few. By and large, the above combination of features will certainly make a tent the best among 6 person tents. Well, who needs this tent? The Coleman Sundome 6 person tent is most ideal for tall people. Even at slightly over 6 feet, you will comfortably walk around your tent as you go through your intent chores! A good tent provides just more than shelter and privacy. The Sundome gives you more than that by offering an incredible interior space and unrivalled peak night. This is a guarantee that anyone can comfortably walk around the tent without any night limitation making this one of the most comfortable tents. When it comes to sleeping space, the tent has a recommended occupancy of 6 people but will accommodate up to 7 medium sized campers. While most group campers do not make this feature a priority due to their ability to tackle such chores collectively, the Coleman Sundome 6 person tent stands out as one of the easiest to pitch. The dome design features continuous pole sleeves and a fitting rain fly awning. This tent also features insta-clip pole attachments that will make it stand firm even in the strongest of winds. These and other features make it possible to pitch this tent in just ten minutes after an adventurous day using the simple spin and ring set up mechanism. Patented WeatherTec System makes it ideal for all camping environments. Has additional storage pockets to keep the tent neat and tidy. When the rain fly is on, not much ventilation is available. Rain fly hooks are made of plastic, these may not be very durable if your camping is mostly in windy environments. You can always have extra clips though. Despite the few cons of the Sundome 6 person tent, the tent remains one of the favorites for most campers. It seamlessly blends comfort, quality and cosmesics in a way that you can only imagine. We recommend this tent to group of 6 campers or less who would want a more spacious sleeping space and an admirably tall peak size. Finally, this tent is fairly affordable and even cheaper when you buy it from Amazon. Many 3 or 4 season tents do not offer everything as they promise. For instance, a particular tent will offer incredible ventilation during warm weather but it may not protect you from the cold. Or, another tent may be amazingly warm but will leak in water even in the slightest of rainy environments. This is the reason why it is sometimes advisable to go for a seasonal tent like the Coleman Steel Creek 6 Person Fast Pitch Dome with Screen room. Now, who should consider buying this tent? If you are a family or a group of friends of 6 people or less them that means you pass the first qualification criteria. Again, if you plan to camp in the summer or non-snowy environments then this Coleman tent is just perfect for you. Don't get us wrong, we just do not recommend this tent for winter and snow camping, it will fit many other weather conditions. Nothing is as fulfilling as having the luxury to enjoy porch lounging on favorable weather during camping. This tent offers you just that as it has an extended porch separated from the main sleeping room. The spacious porch has a capacity of about 4 portable chairs hence good enough for table games, or just a good view of the environment during the day or at night. More importantly, this tent has sufficient ventilation in the windows and the mesh wall at the back. No one wants to go shopping every day. That is why Coleman gives their customers a tent that will last for years, or decades when used correctly. The primary material is mesh polyester which has the ability to withstand shear and tear of the outdoors. You are probably asking yourself why steel features in the name. Well, the poles are made of steel and you know exactly what that means. Super strong and durable! Easy to set up using the already attached poles. Spacious enough to efficiently to accommodate two queen size mattresses or 6 people in sleeping bags. Illuminated guy lines makes it visible at night. The back mesh fabric allows in cold. This can be prevented by using covering it up with a thicker fabric. This Coleman Steel Creek 6 Person Fast Pitch Dome with Screenroom review only highlights its the most important features. However, at an affordable rate you get to enjoy other amazing benefits that include fast pitch, great portability using the provided carry bag and a good peak height. If you are a fan of warm weather camping then this tent will be your lifetime companion. 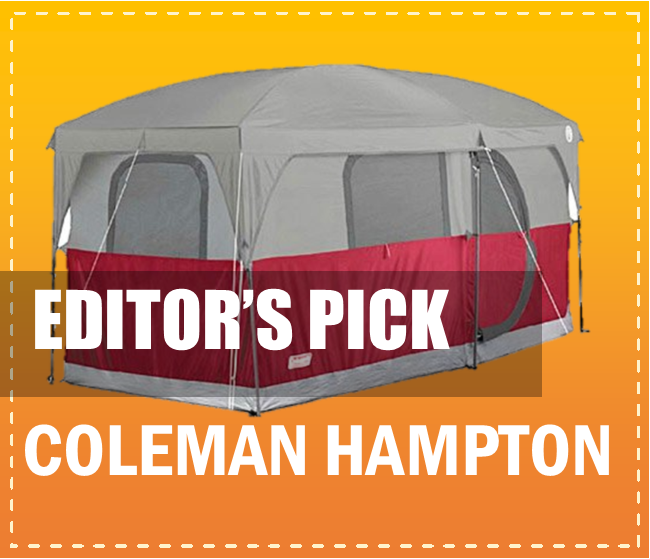 The Coleman Evanston Screened 6 person tent took the top spot in this review due to its blend of essential features. It is easy to pitch, spacious and durable. Who is the Coleman Evanston Screened Tent most ideal for? We acknowledge the fact that this is one of the most spacious 6 person tents. In fact, the manufacturers of the Coleman Evanston Screened Tent and some expert reviewers indicate that it is best for 6 and up to 8 users respectively. However, while these claims may be true, we recommend that this Coleman tent should be used by a maximum of 6 people and most preferably 4 or 5 for the sake of comfort. It is therefore a tent suited for small families and groups of friends. First things first so we begin with the feature that ensures that you remain safe, healthy and maximize the fun. The system, which remains a notable feature among Coleman tents, ensures that you keep yourself safe and healthy through its welded floors and inverted seams that keep out wetness and cold respectively. Fitted beautifully with four windows and a meshy top, you have the opportunity to enjoy warm nights and a view of the stars without exposing yourself to flies or any bugs. Well, when the weather gets terrible, protect yourselves using the rain fly. Isn't this amazing? A good family tent should be able to accommodate all the group members! That is what the Coleman Evanston Screened Tent offers in its commendable interior space that will easily fit two queen- size air beds. Do you think your family or group can comfortably find sleeping space in two queen size air beds? If all or most of you have small or medium size bodies then you certainly will. However, a group of larger people may need to be less in number to maximize comfort. Easy to set up and take Downs. Screened porch design makes it more fun. The awnings outside the windows may block a bit of the outside view. The guy lines come out too far making it quite easy to trip over them. Just like the name suggests, Coleman Evanston Screened Tent is designed to provide you with a screened porch which is a unique and highly essential feature. You get a rare chance to enjoy every type of weather without necessarily having to put your life at risk. As our editors' choice, this is a tent that we confidently recommend. However, if you are looking for a feature that does not come out clearly in this Coleman Evanston Screened 6 person tent then it will do you good to read through the next reviews. Family camping is now more fun and comfortable with the Camp Creek 6 Tent from ALPS Mountaineering. The freestanding tent is a 3 season tent that guarantees a good home away from home in most camping environments. While that is an almost common promise by all competitor companies and products, ALPS Mountaineering goes beyond empty promises by delivering on their promises. This is absolutely the reason why this tent made it to this best camping tents review. Before we get to the key features of this tent. It is important to state that this tent is most ideal for people who want to have the most effortless pitching. This, however, does not compromise any of the essential camping tent features. You need a tent that is easy to pitch because while camping is fun and adventurous, it can get extremely demanding and tiresome particularly after a long day of trekking, hiking or other strenuous outdoors. An important aspect of freestanding tents is the fact that you can effortlessly pitch them in no time. It is also important to state that you can set it up anywhere including on rocks or hard surfaces where sinking holes is almost impossible. This is aided by freestanding super light fiberglass poles and clips that easily snap over the poles. Most freestanding tents have general demerit in their sloppy sidewalls that make the space along the sides smaller. The ALPS Mountaineering Camp Creek 6 Person Tent does not have this problem as its straight side walls allow enough room for cots and enough standing space. This tent is also equipped with a mesh storage shelf, guy ropes and stakes. Additional storage shelf to keep the tent gear organized. Large windows essentially keeps the tent ventilated. Weatherproof makes it a good 3 season tent. Slightly more expensive than your ordinary tent. The ALPS Mountaineering Camp Creek 6 Person Tent, Coal/Teal is your ideal car or festival camping tent. It is spacious, has an amazing peak height and offers incredible ventilation. If you intend to upgrade your tent with a better one then this is a tent we highly recommend. Try it out or buy it as a gift to a friend you value! Look! When you are planning to adventure in environments that are out of the ordinary then you need a heavy duty tent that will perform beyond the general expectations. The Dream House Heavy Duty Glamping Tent Safari Tent is such a test. It has the ability to effectively warm you up in extremely colder or rain situations and also guarantees unbeatable airflow and a safari feeling in the boiling summer temperatures. This is a striking contrast. Right? Like any heavy duty tent, this Dream House tent is ideal for summer camping, or camping in rainy situations when you need to either keep your family refreshed or dry. Let us find out what makes this tent tick! One thing about safari tents is their adaptability. The Dream House Heavy Duty Glamping Safari Tent is one such tent that features a heavy duty ground sheet that can be zipped. When unzipped, you have the option of rolling up the sidewalls to permit wind to pass underneath for fresher and cooler breath in the scotching summer weather. However, you do not have to worry about the summer rains that often come from almost nowhere. The main material is a heavy duty cotton fabric that will effectively keep your tent dry. The buzzing of mosquitoes is a sure way of having a troublesome night and in turn a less comfortable sleep. Worse, even with antimalarial vaccination, you may still end up with malaria after nights of mosquito bites. You do not have to add mosquito nets into a gear that might already be too heavy. The Dream House Heavy Duty Glamping Safari Tent is equipped with a mosquito reveal at the door and each of the windows. Packable and comes with a carry bag. Equipped with strong guy ropes and tent pegs. Has an easy to clean PVC ground sheet. Withstands sufficient speeds of wind. Will leak a bit on the first day in rain but that should not be a concern as this disappears with time. If you are looking for a 4 season tent that will offer more than it promises then the Dream House Heavy Duty Glamping Tent Safari Tent is your option. With this Dream House tent, you are guaranteed a dry abode during rain and cool breeze when it is scorching hot. Again, cotton is warm so you will not be freezing when the weather turns cold. A good 4 season tent is hard to come by, but this is one we can confidently recommend. As a customer, you may often not have the extravagance of testing out all items you may need to use. Therefore, reading through other users' reviews is sometimes an important undertaking to make before you decide on what to carry home. The Kodiak Canvas Flex-Bow 6 Person Canvas Tent, Deluxe is one tent you will fall in love with due to its popularity and the praise it attracts from users. While this tent is has a number of merits, it arguably has a few concerns and settling in it will basically depend on the features you value more as well as the type of environment you intend to camp in. It is a high end tent that is most ideal for people who want to get the best from their camping. The main reason why this tent is popular with most users is because it brings together key features that are hard to come by in a single tent. Despite being a non-freestanding tent, the Kodiak Canvas Flex-Bow 6 Person Canvas Tent, Deluxe is easy to pitch, incredibly spacious, durable and has a good height all-round. Ventilation is also a component that is well sorted in this tent as it the tent is made of a breathable cotton fabric to reduce condensation. More importantly, the tent has a front extension where you can have your good time when camping. The Kodiak Canvas Flex-Bow 6 Person Canvas Tent, Deluxe will serve you for years, if not decades. The trademark Hydra-Shield cotton canvas is strong, durable, and breathable while still watertight. The flex bow frame is made from galvanized steel tubing with steel rods reinforcement provide an astoundingly stable frame. This, in essence, will withstand shear, tear and wear associated with outdoor environments as well as wind. Like most users assert, the Kodiak Canvas Flex-Bow 6 Person Canvas Tent, Deluxe is a tent you will enjoy carrying along. The features are amazing and despite the fact that you have to stake its poles, you can always want to go through that to enjoy more. Just like other users, this is a tent you will recommend to friends and relatives. Do not look at the price! The Black Pine Sports Freestander Turbo Tent is the tent you need for all your outdoors. It will come in handy when camping, backpacking as well as in beach festivals and parties. It is beautifully designed, sturdy, durable and easy to pitch. Although this tent comes at a much higher cost than most tents, it is a tent whose features enable it to withstand the harshest weather conditions. The tent is ideal for people who do not want to stock so many tents for various occasions. It is designed and equipped to suit your needs in different environments and functions. A tent that will go all the way with you to all your outdoor functions is not hard to come by. A trait of such a tent would weatherproof, rainproof, comfortable, durable, spacious and adaptable. Well, that is exactly what the Black Pine Sports Freestander Turbo Tent-6 Person is all about. You are guaranteed of good shelter and privacy to parties, festivals, hunting and back camping among other enjoyable outings. The best thing of 6 person tents with wider doors is that they provide easy and convenient entry and exit for the entire group or family members. Have you all imagined the 6 of you always having to squeeze through a single tiny door? I bet it is really inconvenient. Movement aside, a larger group of campers need good ventilation. A large doors and windows are designed to provide you with that, and more! You will have to dig deeper into your pocket but it is worth it. Although weight may be a concern when you decide to purchase the Black Pine Sports Freestander Turbo Tent-6 Person but this should not be a big issue as you will most certainly be going out in a car or truck. It is an ideal car for festivals, hunting, hiking or camping. You can also consider it as a gift for someone you hold dearly and they will certainly see you every time they pitch it. Who needs a 6 person tent? This kind of tent is ideal for families, young adults or a group of friends who intend to enjoy recreational camping, enjoyable outdoors or enough room for engaging in tent activities. Well, while we have exhaustively given you the most impartial best 6 person tent reviews, it is important to also consider some of the general features to consider before settling for a given tent. This is because there are so many tent varieties and brands in the market that even with detailed reviews, you may have a difficult time making a choice. Fast forward, what are the most essential tips to consider? The general recommended occupancy of these tents is 6 people. However, since they vary in dimensions and interior area, you may end up with a smaller tent when buying your ideal 6 person tent. This brings us to the question, when is a 6 person tent smaller? Basically, freestanding tents do not need to be staked on the ground while non-freestanding tents have poles that must be staked to the ground. Free-standing tents are more easy to pitch and will pitch even on rocks or hard grounds while non-freestanding tents will need softer surfaces for staking. On the hand, non-freestanding tents have a better chance against winds. Just like any other product you can find around, tents are available in a wide range of prices. Depending on your budget, you can have a 6 person tent from as low as under $100 to as high as almost $1000. However price is not the sole determinant of quality as you will certainly find budget friendly tents that are up to task. Generally, without compromising shelter and privacy, a good tent should also guarantee good airflow. Ensure that the tent you intend to buy has at least two big windows, a big door or some mesh walls. These will ensure good airflow and reduce condensation rates. Finally, a meshed roof will also give you an incredible view of the sky and beautiful star patterns. The cosmetic value of a tent varies from one person to the other. Common tent designs and shapes include dome, cabin and safari. While you may have a preferred design or shape, each design has its strengths and weaknesses. For example, dome tents are a breeze to pitch but may not be able to withstand ultra-hazardous environments. In the other hand, safari tents will make you disconnect better as you can fold all its walls for a more relieving airflow and view. On the other hand, they averagely weigh more than twice the size of those of other designs. Family or group camping means more camping gear hence the need for a bigger storage area. Depending on your entourage and luggage, you may want to choose your tent based on the amount of storage space on offer. Bigger vestibules will certainly accommodate camping gear for the entire family or group while storage pockets will help with the storage of small items such as sanitary and phones hence keeping your tent more organized. Lastly, if you are camping in a site where there is electricity and you may need it in your tent then it is advisable to have a tent with a power cord port. While 6 person tents have a standard occupancy of 6 people, the interior size and height vary from tent to tent. Averagely, it is advisable to have a tent that is at least 6 feet tall as this will provide enough height for you and your team to move around the tent as you go about your in-tent activities. In a case where some team members are taller than 6 feet, you may need to opt for a taller tent. The types of materials used in making a tent determine its strength and durability. Materials should be able to withstand wind, tear and wear associated with most outdoor environments. Again, poles should be strong enough to withstand the weight of the tent as well as frequent movements. A tent that comes with additional accessories such as a foot print without any added costs is a good pick. Most of these accessories not only help to prolong the lifespan of your tent but also make your camping or backpacking more interesting and enjoyable. As a group or family, you will be using a car or truck to your camping site. However, you still do not need a whole ton of a tent hence the need to settle for a tent you can easily carry and pitch.